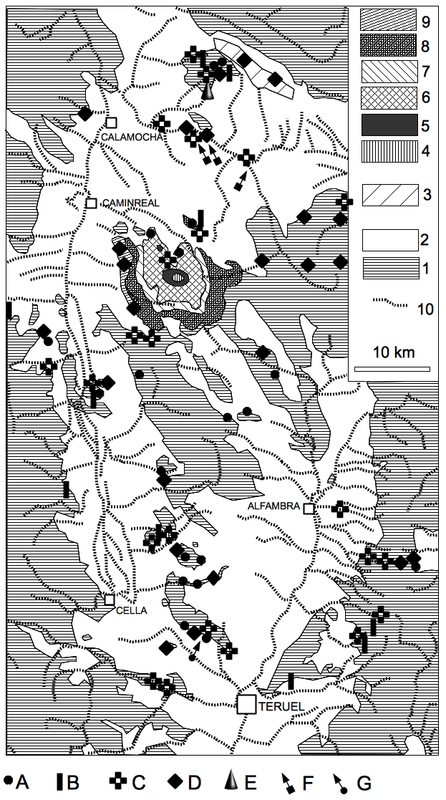 Different from the Azuara impact area where large parts of the structure have in detail been mapped on 1 : 10,000 and 1 : 20,000 scales (within the frame of numerous diploma theses performed at the university of Würzburg, Germany), the geologic mapping in the Rubielos de la Cérida area is represented by the official maps on 1 : 50,000 and 1 : 200,000 scales which are often broad-brush only and in many cases simply wrong. We point to large areas near Visiedo, Argente and Lidón (geologic map 1 : 50,000, sheet 517 Argente) where Paleozoic/Buntsandstein has been mapped as Malmian, and likewise large areas northeast of Teruel (geologic map 1 : 50,000, sheet 542 Alfambra, and sheet 567 Teruel) where Muschelkalk has erroneously been mapped as Rhaetian/Liassic leading (in the maps) to a very curious geologic setting. The general stratigraphic column in Fig. 1 illustrates an important situation that is the enormous thickness of more than 10 km of the purely sedimentary target for the Azuara impact event. This has lead to a wealth of various impact rocks (impactites) with many so far unknown lithologies and textures including peculiar impact carbonate and sulfate rocks, and to many breathtaking exposures of a peculiar structural setting. This is different from all the impact structures in a crystalline target where the impact rocks are in most cases limited to a few types, and even in mixed, crystalline/sedimentary, targets like e.g. in the Ries impact structure the variability of impactites and structural features is comparatively moderate. Unfortunately, this absolute highlight of Spanish educational geology and geology in general is still widely kept under wraps which is in more detail addressed on the extra pages Controversy. Fig. 1. 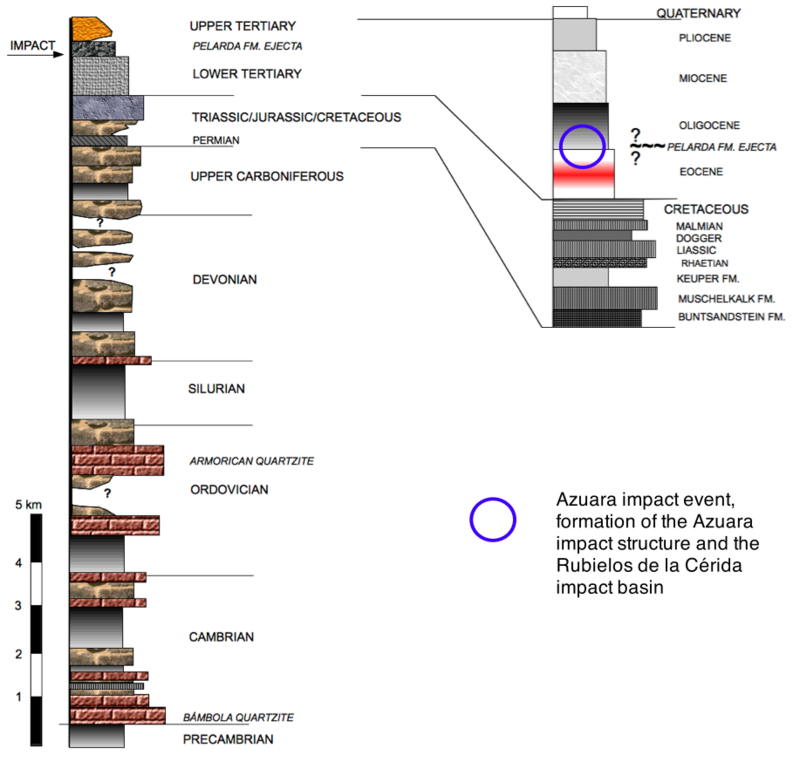 Stratigraphic column of the Rubielos de la Cérida impact target. Originally and as has been written in the Introduction, the Rubielos de la Cérida companion to the Azuara impact structure was ascribed to the northern part of the elongated basin only where a more or less circular central uplift showed the typical structure of a complex impact structure. 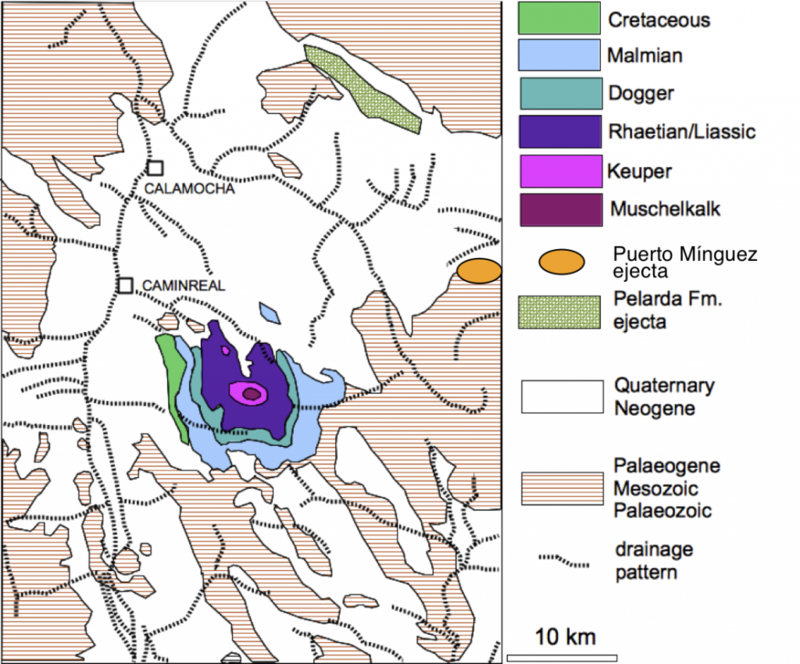 The general geologic map and a section across the uplift is shown in the Figs. 2, 3. Fig. 2. Geologic general map of the Rubielos de la Cérida central uplift and the surrounding basin delineated by a characteristic drainage pattern. Marked in the map are also the major impact ejecta deposits, Pelarda Formation and Puerto Mínguez ejecta that are addressed on extra pages. Fig. 3. 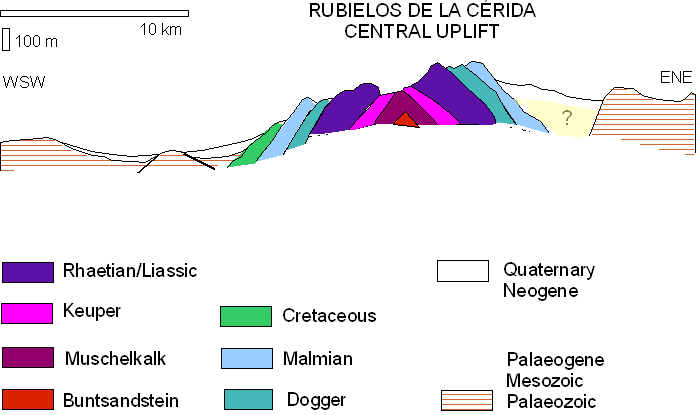 Geologic cross section of the Rubielos de la Cérida central uplift. Near the Rubielos de la Cérida village in the very center of the uplift Muschelkalk limestones and dolostones are exposed as the oldest stratigraphic unit. In Fig. 4 a rough geologic general map shows the extension of the Rubielos de la Cérida central uplift to the now established elongated impact basin some 80 km long and 40 km wide. In the map major exposures of the various impact features have been indicated; in fact there are many more, and the map will be complemented bit by bit. Fig. 4. Simplified geologic map of the Rubielos de la Cérida impact basin and major occurrences of impact features. 1 = Paleozoic, Mesozoic and Lower Tertiary, 2 = Upper Tertiary and Quaternary, 3 = Pelarda Formation ejecta, 4 = Muschelkalk, 5 = Keuper, 6 = Rhaethian and Liassic, 7 = Dogger, 8 = Malmian, 9 = Cretaceous, 10 = drainage pattern. A = basal suevite breccia, B = breccia dikes, C = megabreccias and monomictic movement breccias, D = shock metamorphism, E = shatter cones, F = impact melt rocks, suevites (Barrachina type) and suevite-like breccias, G = impact glass (pseudotachylite? ).